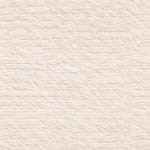 Spoiler: We tried two applications of Sodium Bentonite clay (100 tons total) to seal our pond and it did NOT work. Two years ago dad & I hired Harmon Mansell to work 72 tons of Sodium Bentonite clay (which swells when wet) into our pond site to hopefully seal it. Before that work, the pond would leak about a vertical foot each week after heavy rains would temporarily put water into the pond. However, after the Bentonite clay was worked into our pond bottom the pond would leak a vertical foot per month (instead of per week). So the Bentonite clay helped - but not enough. So we hired Harmon to come back and throw 24 more tons of Bentonite clay onto the water's surface in the hope that the Bentonite will settle to the bottom and seal up the remaining leaks. Be sure to check out the Windows Media Video clips at the bottom of this page. 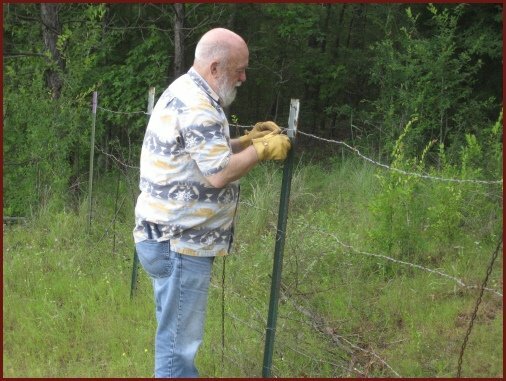 In the picture above, dad is cutting our fence to let the big equipment get onto our land. The large trucks were too long to turn into our main gate. 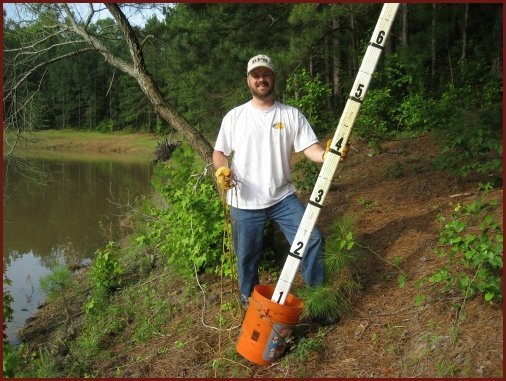 We figured it would be a good idea to remove the water gauge from the pond before Harmon began throwing the Bentonite clay into the water. This picture was taken near our front gate. Harmon showed up with three workers (including his son) and a lot of equipment. They all seemed to be really friendly,hard working fellows. Harmon is incredibly talented at using those dozers. 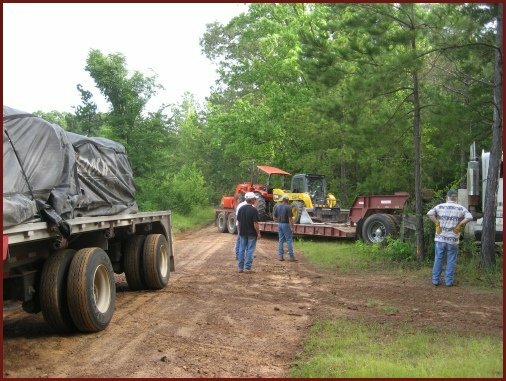 That flatbed trailer held all 24 tons of the Sodium Bentonite clay. 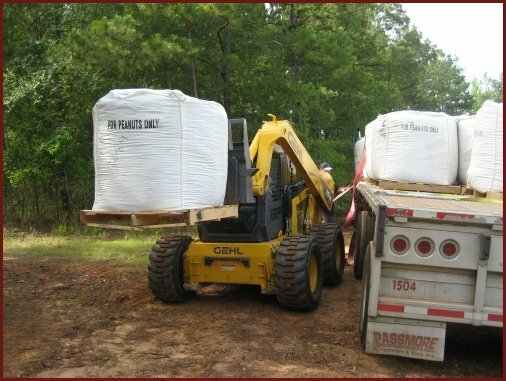 There were 16 sacks of Bentonite, each weighing roughly 3,000 pounds. 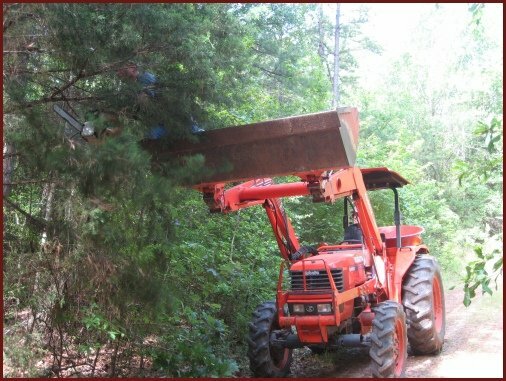 A couple of Harmon's crew trimmed the trees on our road leading to the pond site so that the large trucks wouldn't get scraped by branches. If you look closely you can see a guy in the bucket of that front-end loader working a chainsaw. 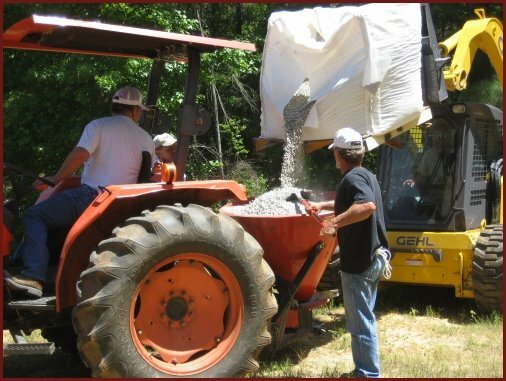 Filling the hopper of the tractor with Sodium Bentonite clay pellets. Throwing the Bentonite pellets into the water. That spreader could toss the pellets 60 feet. 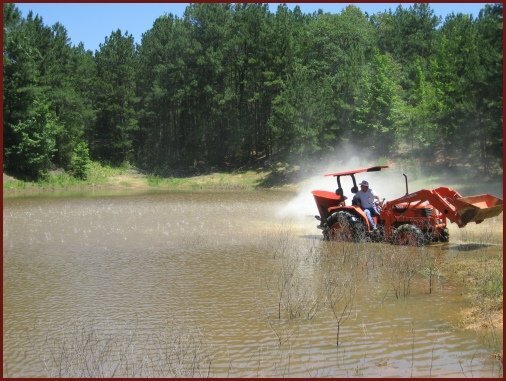 Harmon would move the tractor to various points around the pond to ensure an even layer. My buddy, Jeff Cotten Jr., came out to watch the action. 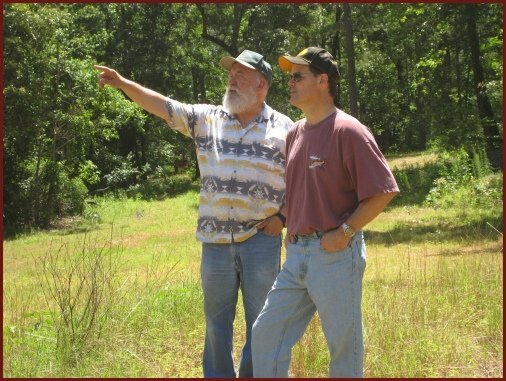 Dad is explaining to Jeff where Harmon will position his tractor next. Here's how the pond looked after Harmon was done. The white substance visible around the perimeter is the Sodium Bentonite clay. 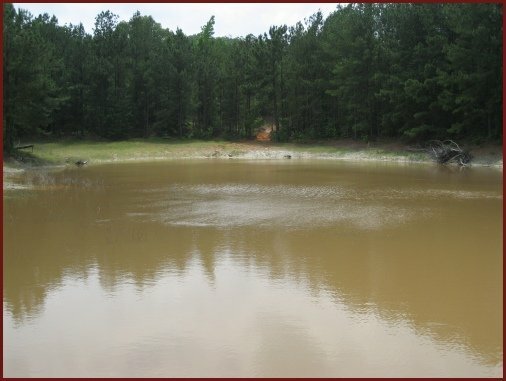 Most of the Bentonite clay should sink to the bottom and swell - forming a matt on the bottom of the pond. Hopefully, this will greatly slow down the seepage. Update: Nope, the additional 24 tons of Sodium Bentonite clay (for a total of nearly 100 tons now) did not work. The pond actually leaks worse than before we tried to seal it with the Sodium Bentonite two years ago. We think that all the dozers and tractors broke what little natural seal the pond had. Very disappointing!! !